The Marshall Plexi Super Lead 1959: a "unique model of the quintessential rock'n'roll guitar amp," according to Softube. MUSIKMESSE 2015: Seven months after it announced that it was entering into a strategic partnership with Marshall, Softube has revealed its first fruits. The Marshall Plexi Super Lead 1959 is a new plugin that'll be available exclusively for UAD-2 and Apollo systems, and is based on a 1967 Marshall Plexi amp that has been kept in pristine shape and stored in Marshall's own museum. On the subject of mic and cabinet simulation, Softube consulted with engineer Tony Platt, who's worked on many classic records, who suggested a straight 1960BHW 4x12 inch speaker cabinet loaded with Celestion G12H-30 speakers. There are three mic sets with three mics in each - two close and one room mic - and these can be selected from a channel strip that can be opened in the plugin's side panel. 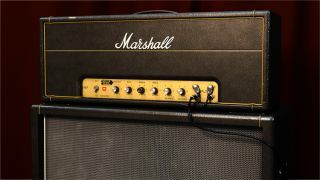 The Marshall Plexi Super Lead 1959 will be released in May and priced at $199. Find out more on the Softube website.